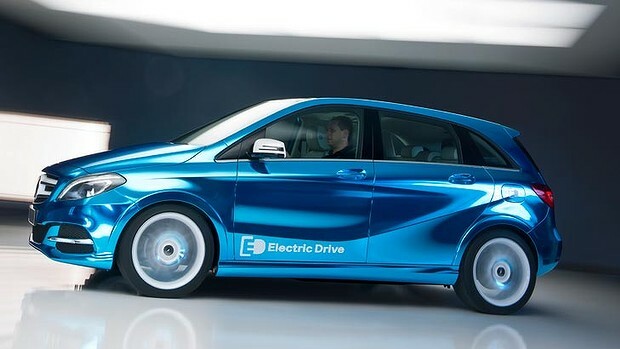 Mercedes-Benz showed a Concept B-Class E-CELL PLUS with Range Extender at the 2011 Frankfurt International Motor Show. We have reported on rumours suggesting both Tesla and BYD have been working on a B-class EV in partnership with Mercedes. The Concept B-Class Electric Drive is equipped with a 100 kW electric motor whose powerful 310 Newton meters of torque provide for attractive driving dynamics over a range of 200 kilometres. The battery can be charged at any standard domestic 230 V power outlet or alternatively - with rapid charging function - at a 400 V high-voltage terminal. In the B-Class, Mercedes-Benz has at its disposal an extremely versatile car which is suitable for the most diverse types of drive - from combustion engines through battery-powered drives to the fuel cell. Thanks to Energy Space, the B-Class is the ultimate all-rounder and the Mercedes trailblazer for alternative drives in the compact premium automobile segment. The particularly family-friendly electric car from Mercedes-Benz is almost ready for series production, with the market launch already planned for 2014.